Start Shield replica - information about arming. Shield replica - information about arming. A shield is a part of the soldier's defensive armament. It was invented as early as in the Bronze Age and it has been successfully used both by infantry and cavalry. At the beginning, it was created from such materials as wood, wicker, leather or metal. Later models were based on wood, enriched with material, leather or metal bruising. Interestingly, such kind of protection, originated in the Bronze Age, is still in use. Anti-terrorist squads and the police still take advantage of the invention created thousands years ago. It is one of the reasons why everyone who is interested in history, should have some knowledge of shields. Apart from the theoretical information, the historical reenactment, organized by contemporary knight guilds and warrior teams, is an invaluable illustration of the “living history”. A hoplon, also referred to as an aspis, is a round shield from the period between the seventh and third centuries BC. It was used for protection by the Greek soldiers, especially the heavy Spartan infantry, who were called hoplites, namely because of their shields. It was produced from the oak wood, with leather applied to the inside part. To the outside part, leather (usually of a bull) was also added, as well as bronze, with particular attention to the edges. Moreover, the characteristic decorations were usually put on the outside, in the form of an individual figure mark (the most common theme was the head of Medusa), an ideogram or a specific initial of the particular polis (city-state), for example an owl in the case of Athens. The oldest initial discovered so far is "Λ" (Lacedaemon – Sparta), from 560 BC most probably. In the Spartan army, hoplons (aspides) constituted the basis for the Greek phalanx, which was a special technique of fighting in a formation. The soldier was supposed to stand in a line, very close to the other hoplites, so that his shield overlapped the one held by his colleague on the left side, at the same time hiding under the edge of the shield carried by a warrior on the right side. As a result, the nearest soldiers were moving a bit back and to the left. The troops formed in this way moved in slightly slanted rows. Since the formation required the maximum tightening, only one type of weapon could be used, namely a spear. The squeeze was so tight, that it made it impossible to fight with a sword. By creating such a "wall" of shields, the warriors attacked their enemies with the blades of spears, which have measured up to 2-2.5 meters. The blows were inflicted obliquely downwards, aiming particularly at the torso, arms and face. The poet Tyrtaeus wrote songs praising the virtues of the Greek phalanx and he emphasized that the key aspect of it was to fight shoulder to shoulder with colleagues, without any individual daring exploits. At the time of the phalanx, such heroes as Achilles would not be appreciated, but just the opposite, they would be criticized for breaking the solid formation. 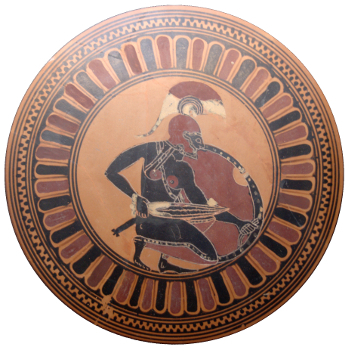 The significance of a shield in Sparta can be illustrated by the words usually repeated by a mother who was saying goodbye to her son before a battle: “come back with the shield or on the shield”, namely as a winner or dead. What is more, the lack of a shield was even punished with death penalty, while returning without a spear or a helmet did not cause any outrage. Some poleis tried to follow the Spartans, while in the other armies it was a shield to be dropped at once in the case of a retreat. It was because of its weight, which made the escape much more difficult. Pic. 2. A replica of a Roman cavalry shield. The word “scutum” literally meant “a shield” for the ancient Romans. At first, it had an oval shape and later it changed to rectangular. Its task was to repel the opponents' blows effectively and from the fifth century BC it became a part of the obligatory equipment of every soldier. It was used until approx. 150 AD, but then mostly just in the form of the decorative Praetorian shields. The oval shields were typical for the republic age, but then, the more robust and efficient rectangular scutum replaced it. It was introduced most probably by Marcus Furius Camillus during the First Samnite War. The previous rectangular shield, called clipeus, originated from Etruscans most probably. The size of a shield allowed the legionnaire to cover the whole body with it. It had a slightly convex shape, causing the hostile blows to slip over the uneven surface. It was 120 cm high, 100 cm wide and 19 mm thick. The scutum consisted of two layers of boards, which were joined with a bullock glue. What is more, the outer side was covered with a layer of cloth and a piece of calf leather. In order to obtain a convex shape, three thin layers of wood (2 mm thick) were applied. 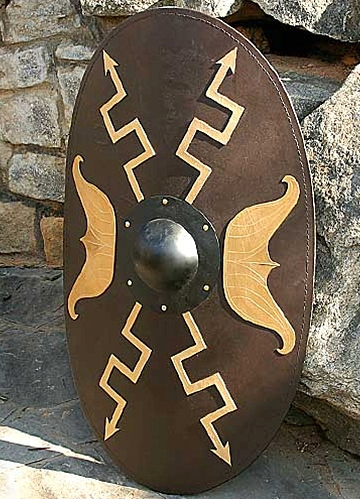 The edges were equipped with a metal hoop, which accounted for additional protection against injuries and allowed to set the shield up on the ground. In the middle of a scutum, an iron bulge called "bump" or "navel" (umbo) was placed. Its main function was to additionally strengthen the shield and absorb the blows at its weakest point. Moreover, an umbo protected a hand, placed directly behind it. Below it, at the inner side, there was a horizontal handle. The surface of the shield was usually decorated with various figures and shapes, for example the images of animals (such as eagles), a lightning symbol or laurel crowns. Unfortunately, not a single complete shield from that age did survive to the present day. The knowledge about their structure and appearance, which we now have, is only more or less far-reaching assumptions based on small adornments in the shape of a shield, the remains of the ferrule formed after the funeral pyre burn or the survived elements of the fitting boards, located in a small amount in Denmark. Pic. 3 The unique replica of a Viking shield. The diameter of a shield can be determined on the basis of the discovered parts of the tubular ferrule and it it varies from 50 to 150 cm. The divergence of these measurements can be explained with the assumption that a shield shape could be oval, or that the high temperature in the funeral pyre significantly deformed the fitting. It is agreeable with the measurements of the shield fragments found in Thorsberg. The surface of the shield was made of alder boards 14 mm thick glued together and at the edges whittled to 4 mm. In the shield construction process, the boards cut through the core were also applied, in order to most effectively reduce the wood deformation caused by changes in humidity. The purpose of nailing the fitting to the shield surface was not just bonding together the individual boards. The proof of that can be the whole fragments of boards (with no divisions or cracks), equipped with ironwork riveted to them. It is also possible that the whole shield was produced of two very wide boards only or even just one. In such a case, the location of the fitting parts, apparently random and unrelated to the division of the boards, seems to make sense. Small fittings, usually made of bronze, presumably did not have a structural meaning, but simply constituted a decorative element. While the long fitting, usually equipped with a set of holes arranged along the edge, typically served to fuse the two adjacent boards. Its another task could be strengthening the weakest point, which was prone to crack along the grain. Its meaning as an additional protection against the opponent's blows is a different matter. There is no doubt that it increased resistance of the shield's surface, although the plate seems rather surprisingly fragile anyway. It was the tubular ferrule to constitute the basic fitting, joining the individual boards together and strengthening the edges of a shield in order to prevent it from cracking and reduce the effect of a sword blow. A pavise is a kind of shield used in the late Middle Ages. In the most common form it had a shape similar to a trapezium or a rectangle. It was made of profiled boards, usually lime, because it was lightweight hardwood. A characteristic element of the pavise was a ridge also formed of wood, running in the middle, across all the shield's length. The boards were glued together and covered with leather; later a linen was used for covering. Onto such a prepared coat, a quite big amount of the insulating mortar was put. The mortar was made on the basis of glue and gypsum. Then, decorative paintings or writings were added. They could have various contents, for example a religious one. Pic. 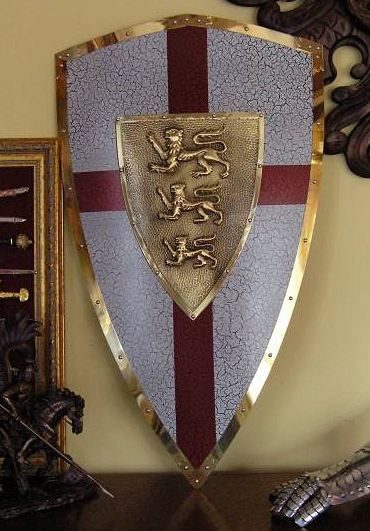 4 Steely replica of Richard the Lionheart shield. The sizes of shields significantly differed from one another, but judging by the originals, they usually reached approx. 1 m in height. However, there were also huge pavises, which were able to cover the entire human figure. They were called the “terrace” ones and they were used for static protection during the siege, usually to cover the shooters attacking the enemy from a distance. The big rectangular shields were previously used in a similar way by the Assyrians. In order to base the pavises more firmly, their bottom edges were sometimes endowed with metal endings, which could have been dug in the ground; while the terrace ones had special props. In the fifteenth century, the pavises were used mostly by the mercenary infantry, while a smaller version of it was popular among the cavalry. The fifteenth-century pavise occurred mainly in the German-Czech (Hussite) circle, although it was also in use in the Western Europe (eg. in Burgundy and Switzerland). The speculations about the origins of this shield are still ongoing. On the one hand, the name suggests a link with the Italian city of Pavia, but on the other, the pavise was also characteristic already for the twelfth-century Balts' military. A kalkan originated from the East, as it was used in Turkey, India, Persia, Mongolia, China and the Arabic countries. However, it was also known in Poland or Hungary. It had a round and convex shape and it was remarkably light. The structure of this shield was usually created of the rattan rods, which were rolled up in a spiral coil and fitted with a metal umbo in the center. Sometimes kalkans were also made of fig or wicker bars. They were combined diagonally or in a dovetail. The braiding was created using silk threads (especially in ceremonial shields) and sometimes linen, cotton or wool. To attach the strings of a handle, rivets were used. One of the strings was long enough to create a loop, thanks to which a warrior could fling a kalkan on his back. Usually, the rivets were endowed with additional protection in the form metal covers, which had two purposes. In the case of a battle kalkan, they strengthened its resistance, while in the ceremonial variant, they had an aesthetic meaning. On the inside of a kalkan, there was usually a linen lining, enriched with a fitted pillow. Its aim was to increase the comfort of holding a shield and using it in a battle. The diameter of a kalkan usually measured approx. 50-60 cm. Pic. 5 A replica of Polish steel shield with an eagle in the crown. The first traces of a kalkan's presence come from the sixth century BC. It was the time when it was depicted on the Persian mid-reliefs, found in a palace in Persepolis. Other representations of this shield can be found in the fourteenth-century Persian iconography. The oldest found original kalkans originate from the sixteenth century. However, relatively few of them were discovered so far, while there are many more kalkans from the seventeenth century, usually of a Turkish origin. It was also the time when those lightweight Eastern type shields appeared in Poland and Hungary. Most of them were the trophies achieved during the wars with Turkey. However, when in Poland the average cavalry became more numerous, the demand for kalkans increased. For this reason, either finished copies were imported from Turkey or raw materials, which were then used in the south-eastern cities of the Republic to produce kalkans, because many Armenians lived there. The decorations were put on the spot and they were noticeably different from the shields imported from the East. They were based mostly on the ornaments characteristic for Polish Armenians or those associated with the Western Europe. In addition to the regional division of kalkans, three categories due to their purpose can be distinguished, namely ceremonial, battle and jewel ones. 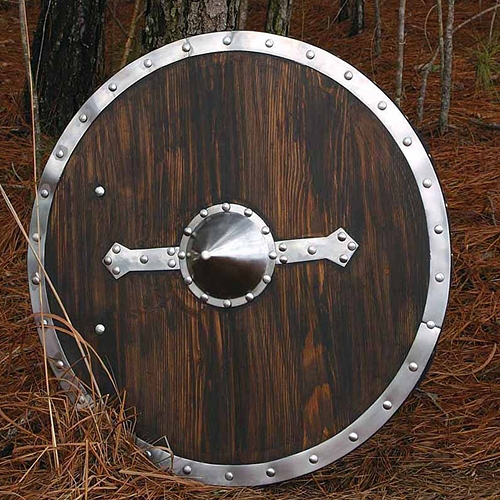 The GlobalReplicas store stocks extremely precise copies of the shields used by the ancient Greeks and Romans, as well as Vikings and the Medieval knights. 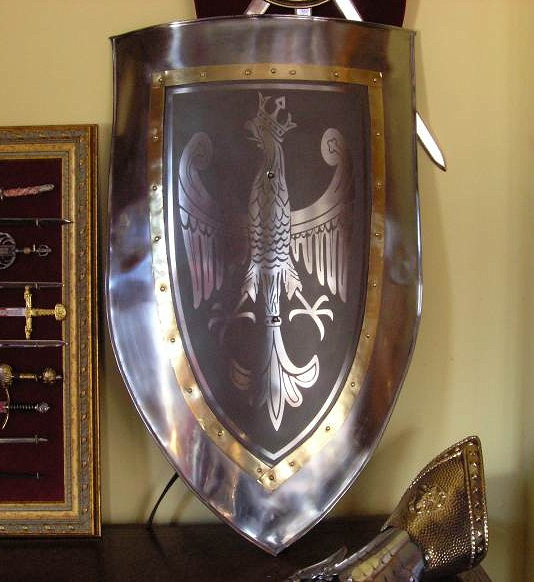 A shield replica is made of steel or hard wood enriched with steel or brass. As it is usually made in the exact size of the historical original, it constitutes a perfect copy of the real artifact. Such a shield replica will certainly be appreciated by every ardent history or military lover.